I am so excited that my favorite season of the year is upon us... Fall! For a lot of people fall is a season of change: the leaves change, the weather changes and, most importantly, your wardrobe and accessories change. Gold is the perfect metal of choice for fall. Not only can it brighten up any autumnal outfit on a dreary fall day, it also stays warm via the heat of your body, which can be nice when Jack Frost starts nipping at your fingertips. 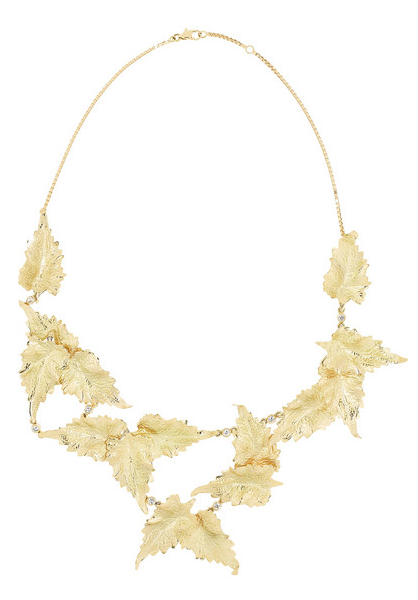 Check out some of my gold accessory choices that can help create the perfect fall look. A hot trend in luxury accessories right now is the hand cuff. 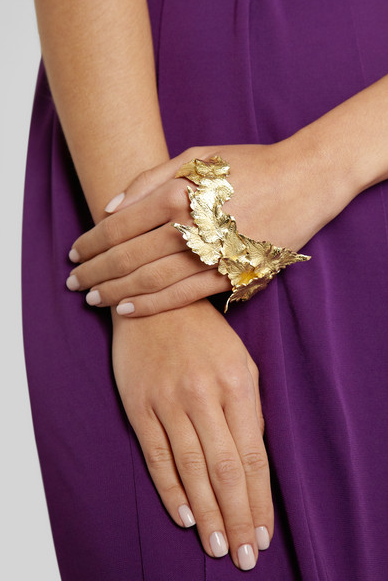 This Ana Khouri 18K yellow gold hand cuff is the perfect nod to fall with its luscious golden leaves. Fall is also known as gala season and this golden cuff is the perfect accessory to stand out in a crowd. 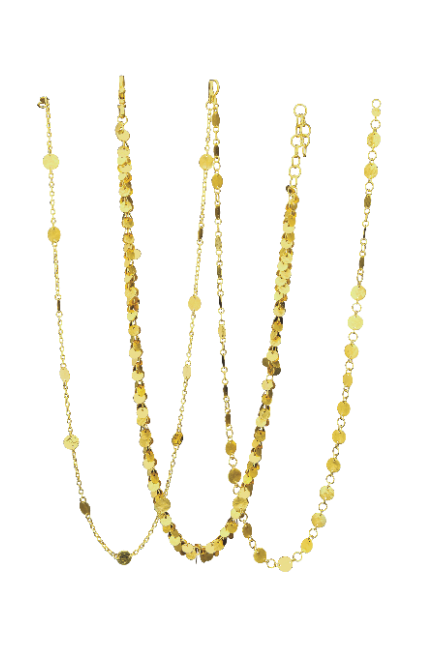 It is an amazing accent piece to the matching 18K yellow gold Ana Khouri necklace featured at the beginning of this post. Who doesn't love a golden leaf for fall? Ear cuffs are a huge trend that I have talked about previously on OJ&B. 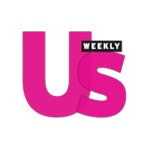 They were sprinkled throughout the Fall 2013 runways and really exploded during fashion week Spring/Summer 2014. In other words, they are super in right now. 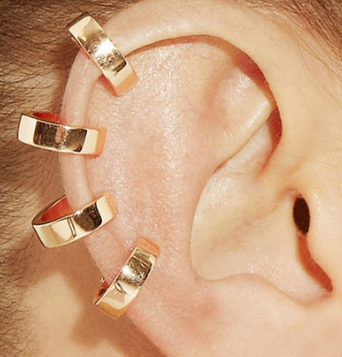 This Repossi 18K rose gold ear cuff is the perfect way to shine bright with this edgy trend. A simple ear cuff can literally transform your fall look by giving it a sprinkle of sass. Everyone in the coffee shop line will be tossing you compliments as you order your pumpkin spice latte. Another hot trend right now in luxury accessories is the return of the charm! 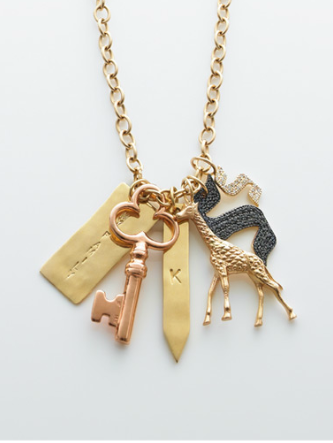 This charm necklace from Jennifer Fisher would add a touch of sweetness to a button up shirt under a crew neck sweater. Jennifer offers a wide variety of charms from fun and girly, to funky and edgy. It is a great way to tell your story without saying a word. If you want to do the charm trend in a fun and unique way, the Jennifer Fisher gold ankle charm bracelet (pictured below) is the perfect way to do so! My favorite thing to do in Fall is to layer. This goes for my clothes as well as my accessories. 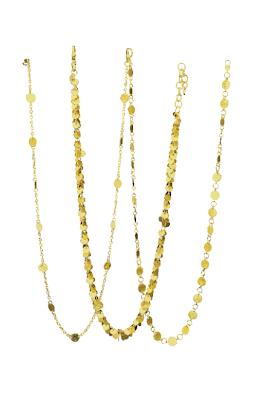 Layering amazing gold necklaces like these 24K necklaces from Gurhan is the perfect look for fall. For day you can wear the look with a button up shirt or blouse and at night you can add a black blazer and hit the town. When the weather outside is crisp the gold necklaces poking below your chic scarf will instantly make you look street style photo worthy. 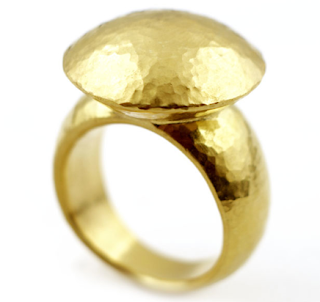 You simply cannot get through the fall without a stunning yellow gold statement ring. I am obsessed with this 24K yellow gold ring from Gurhan. I love when rings use gold as the jewel because it looks so chic yet commands and exudes power all at the same time. A ring like this can be the only ring you wear for the evening or it can be one of many in a mix and match of stacked gold rings and bands. After reading this you should be ready to make your fall shine with gold. What are your favorite ways to wear gold in the fall? Let me know in the comments below!